In 1900, Herman Carlson Levin opened the ‘Herman Carlssons Instrumentfabrik’ factory in Gothenberg, Sweden. Their instruments were of a high quality, winning several awards in Europe. 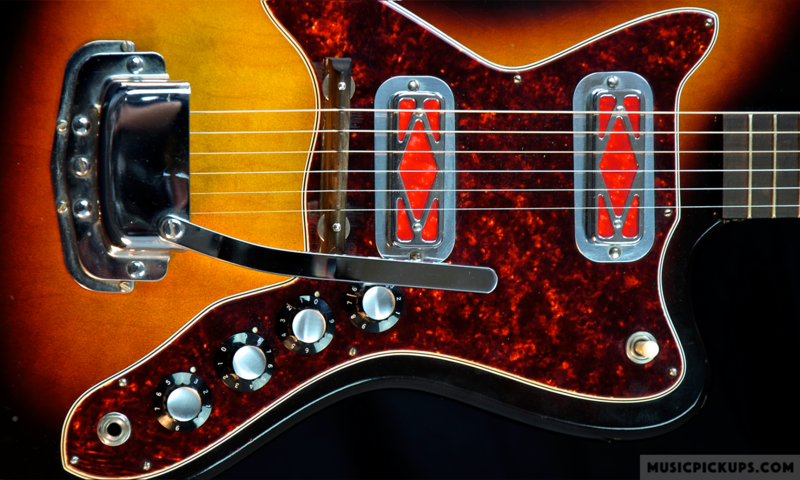 In the 1950s, these guitars were introduced into America, under the brand name Goya. The instrument above is a 1961 Levin Model 315-M2 with two same-height Model 2000 pickups and translucent unnumbered knobs as on DeArmond amps of that period. The company was acquired by CF Martin in 1973, but before that, in the 1960s, they produced a range of archtop electrics which were fitted as standard with DeArmond pickups. This Levin guitar Model 315-M2, dated 1962, is fitted with two Model 2000 pickups finished in well-worn gold with black coil formers. Note the difference in height between the two pickups. Also note that the knobs are by DeArmond, as used at that time in their tube amps (photo copyright www.vintage-guitars.se). The standard DeArmond Model 2000 pickup, gold-plated with a black insert, fitted in the Levin models 315, 340 and 350, as shown in their 1968 catalog. The Model 41 pickup was fitted in the Levin model 360, as shown in their 1968 catalog. This un-numbered pickup that uses the same metal housing as the Model 2000 but with a central pole-piece arrangement very similar to the Model 210 flat-top attachable pickup, fitted in another Model 335 M2 guitar.